Looking for external fellowships, scholarships, or other sources of funding to support graduate work? 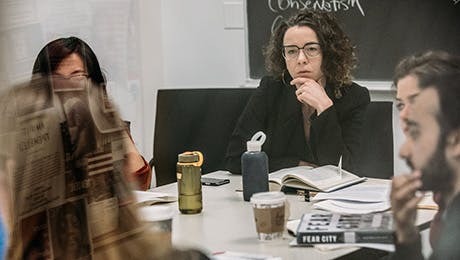 All students at The New School have free and unlimited access to COS Pivot, one of the nation's largest databases of public and private grants and awards. Students can use COS Pivot both on and off campus to search for funding by discipline, amount, deadline, eligibility requirements, purpose of grant, and more. By creating a free profile, users can keep track of searches and upcoming deadlines. To help users get the most from COS Pivot, The New School Library has prepared tips for advanced searching. Questions can also be directed to ProvostFRF@newschool.edu. Applications for external funding can take time. It is important to start early, as the application deadlines for some grants can occur up to year in advance of the award period. Starting well before the deadline can help applicants better anticipate what is necessary to complete an application. The most successful applicants take time to gather materials, consult with numerous reviewers, and complete revisions. Once applicants have identified granting organizations, they can begin writing proposals. The Provost's Office provides support to graduate students seeking external funding. Visit the Provost's website for more information and helpful answers to questions about various application processes.The Social Sciences Research Council (which itself funds many projects) produces and maintains " On the Art of Writing Proposals," which is highly recommended for students. NSSR Career Services keeps on hand application forms for the National Science Foundation, Fulbright, and Fulbright-Hays. Students have access to previous successful applications. Reviewing these materials gives a sense of how to pursue funding from organizations like Fulbright and DAAD (German Academic Exchange Service). Those planning to apply to such organizations are strongly encouraged to request copies, study the proposals, and ask questions. Simply reviewing application forms can reveal that the completion process is long and rewards meticulous attention to detail. It requires assembling many materials, including references and transcripts. It takes a lot of thought to formulate a coherent project. Many application forms include lengthy directions for filling out the application, information about eligibility requirements, and other contractual agreements necessary for a successful proposal. It is vital that applicants fully understand all requirements and restrictions, and it is very important to follow the directions carefully when filling out any application. Successful grant applicants typically consult with as many people as possible regarding the search for funding and the process of crafting an effective proposal. Students should confer with faculty advisors, other members of the faculty, student advisors, fellow students, and friends. A student's faculty advisor is perhaps the best source of constructive critique when it comes to the search and application for external funding. However, the advice of others is also valuable. NSSR student advisors may be able to provide additional information about funding agencies that have previously awarded funds to NSSR students. They may keep a file of successful applications from previous years. Be sure to ask. Fellow students may also be helpful. Consider forming grant-writing groups with colleagues to review one another's proposals. Sharing critical feedback with peers is an efficient way for applicants to receive advice from many different perspectives. Remember that proposals will likely be rewritten several times before they are submitted. Using as many reviewers as possible not only helps applicants catch and correct errors but also aids in the process of gaining objective feedback about the conceptual feasibility and intellectual worth of a project. Students should consult with Student Financial Services to discuss eligibility for federal financial aid. The office is located at 72 Fifth Avenue on second floor of the Welcome Center. To schedule an appointment, call 212.229.8930 or email sfs@newschool.edu.